The Mountainsmith Scream 55: the ultralight backpack for those who wish to carry more than the bare, 3-season essentials. In testing the Scream 55, I wanted to take this backpack out of the traditional, 3-season ultralight backpacking environment, and highlight the pack’s practicality for ultralight winter backpacking. The Scream 55 is a hybrid between your frameless dyneema ultralight pack, and your traditional framed high capacity backpacks. At 55 liters, it has the capacity needed for a summer thru-hike, and any trips that demand the carrying of heavier loads. 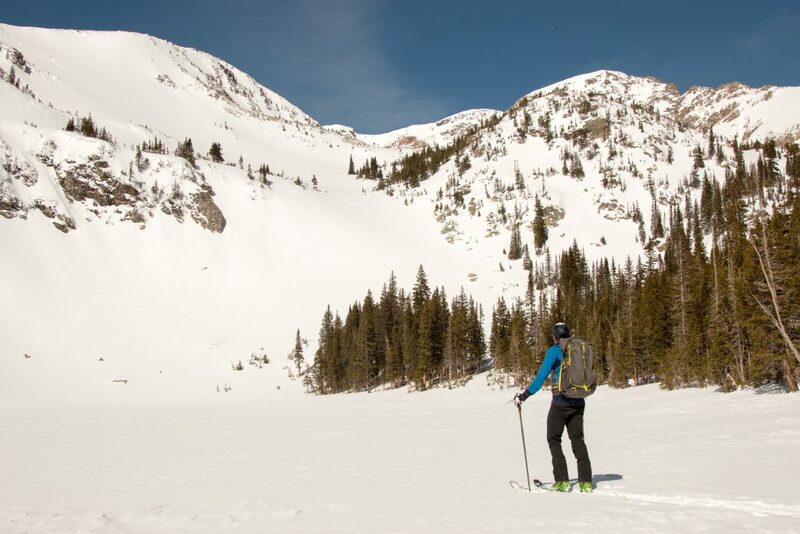 For this review, I took this pack on an overnight ski mountaineering expedition in the Colorado Mountains. 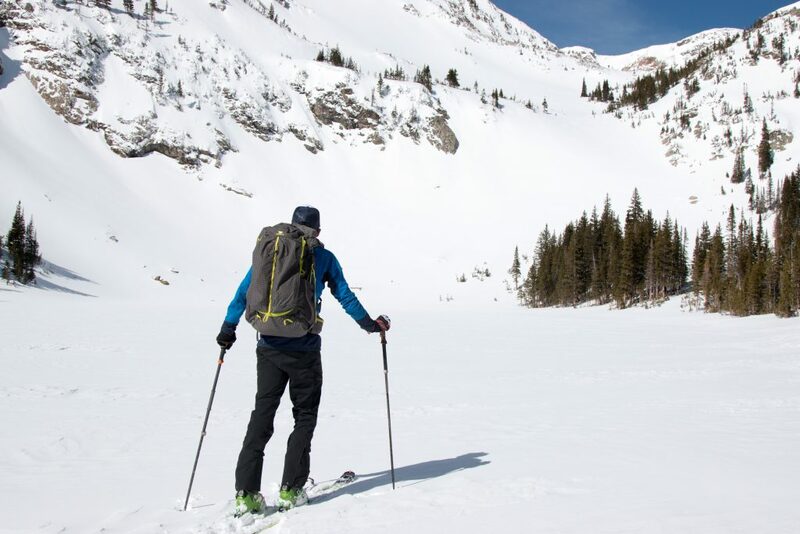 I packed winter backpacking equipment and backcountry ski gear and traveled to a remote alpine lake in the James Peak Wilderness in Colorado. From this base camp, we set out to explore the skiing in this alpine cirque. 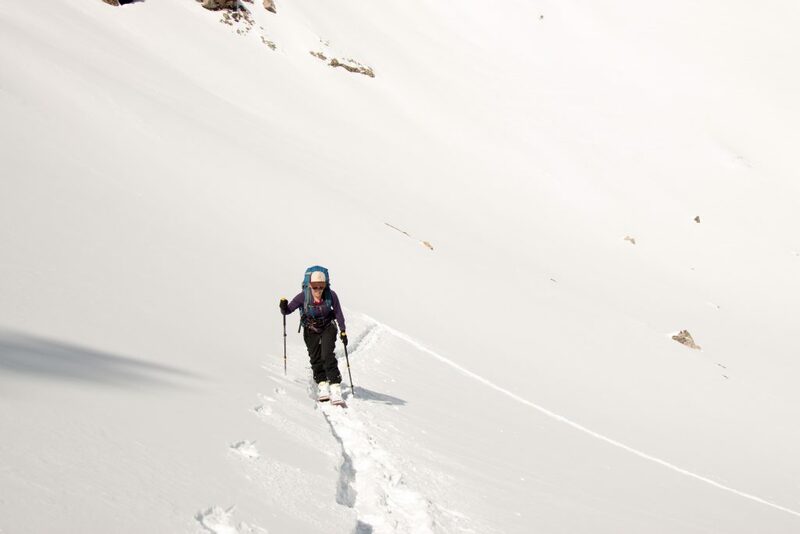 Surrounded by obvious couloirs and technical ski descents, I loaded my Scream 55 backpack with ski mountaineering gear, and set off to see what our snowpack had to offer. The true test for this pack came in the hike into base camp. Carrying a 4-season tent, sleeping bag, food, fuel, in addition to ski mountaineering gear – in total, I had a 40 lb load on my back. The Scream 55 was definitely able to comfortably manage this load. In my thru-hike of the Colorado Trail in 2014, I maxed out my load at 15 lbs using a frameless pack. Backpacking in the winter requires a different approach where there is a requisite for more insulation and heavier gear, something that a frameless pack cannot handle without much difficulty. Based on my experience with ultralight backpacking, this winter environment is where I found the Scream 55 to be most practical. However, I can see the practicality in many different backpacking situations: carrying a bear canister, large water carries in the desert and carrying food for many days between resupplies. Leaving a majority of this 40 lb load at our base camp, this pack performed surprisingly well as a ski mountaineering pack. 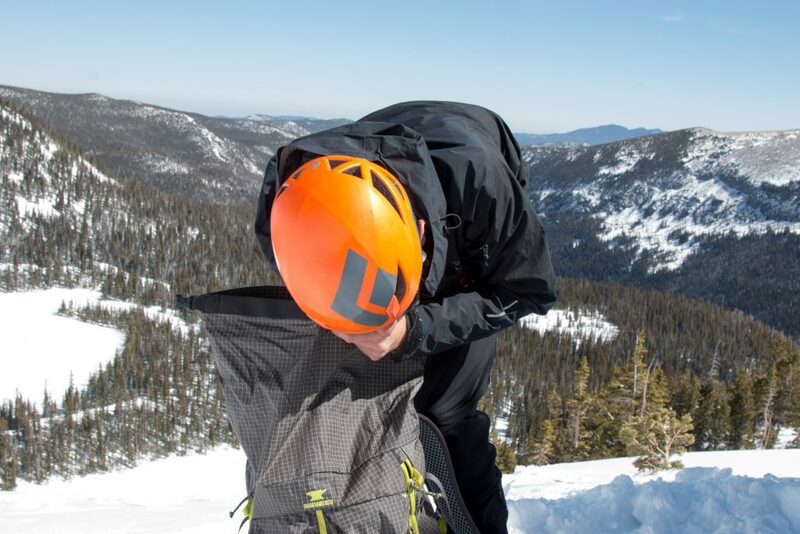 The large J-zipper is convenient to quickly access your shovel, beacon, and probe from the inside of your pack. I was also able to comfortably strap my skis to the outside of the pack for a long boot pack in the steep couloir. On the descents, I was able to tighten all the straps and have a nice, tight package to comfortably ski steep terrain. The pack has traditional rigid, interior, frame that offers comfort and breathability, accommodating heavier loads. The fit was the perfect balance between added comfort with a more supportive waistbelt and back panel. There is a strong, cult following of frameless dyneema backpacks made by ultralight cottage companies. In the last few years, there has been a shift in larger companies, like Mountainsmith, in taking that ultralight look and applying them to their gear. With these larger companies, there is still a lingering fear of durability in truly committing to a proper ultralight backpacking pack rather than the hybrid backpack we see here. Catering to the minimalist backpacker, this pack offers the classic minimalist backpacker look, all the while including a multitude of zippers, pockets, and padding. There are two ways to access this pack, one by a reinforced roll-top closure, and a second by a large J-zipper that surgically reveals the entire contents of the backpack for quick access.The rigid frame and hip belt offer comfort in distributing a pack’s load onto your body. The large water bottle pockets are a welcome sight, as a trend in the industry is to minimize exterior pocket size. Weighing in a 2lbs 13oz, this pack is on par with a lightweight backpacking backpack. The pack is shaped into a tapered, and tight package with two protruding tubular pockets located on the exterior of the pack. 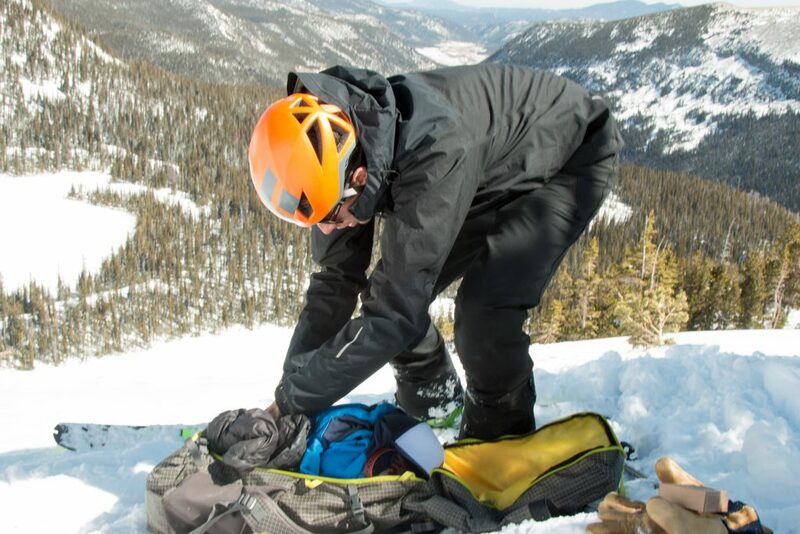 This pack was able to comfortably carry 40 lbs to our base camp, and then comfortably carry the tools necessary to safely ski in the Colorado Backcountry. It’s a workhorse – carry large loads comfortably enough where long hiking days don’t seem as intimidating. If Mountainsmith is known for one thing, that thing is durability. They sure know how to make their gear bombproof and the Scream 55 is no exception. This pack is bulletproof all the while keeping a minimalist weight of 2 lbs 13 oz. I love the look of this pack. It takes the classic look of ultralight backpacking (dyneema-like fabric and roll-top closure), and attaches a durable frame. This is a pack is made for the hiker who wants the miles to fly under their feet, and look to carry more than your stoveless thru-hiker. The two tubular pockets on the front of the pack are an interesting design choice. Stylistically, they stick out like a sore thumb. Most comments I have received about this pack from fellow hikers on the trail concern these pockets and their apparent awkwardness. They distribute weight within our pack further away from your center of gravity, and are impractical for this reason. Overall I’d give this pack a 4/ 5 rating! Shop the Mountainsmith Scream 55 on Outdoor Prolink. Not a member? Apply today! Aidan Goldie is a ski mountaineer based out of Colorado. 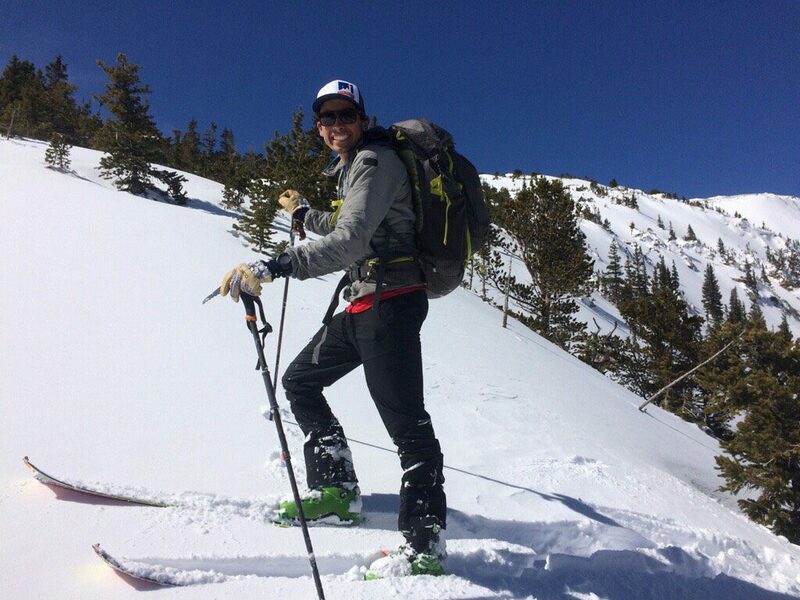 When he is not climbing and descending peaks in the American West, he is an outdoor educator, working with schools and nonprofits guiding groups through the Colorado wilderness. As a backcountry ski patroller, outdoor educator (and Outdoorprolink member) I am strongly considering this pack. I won’t ever be a dyneema pack weight weenie, but am looking to replace my 70L Madden (yes, I am old). My gear has gotten much more compact in recent years, so I don’t need the volume and mega-bomber fabric. It sounds like this would be a versatile quiver-of-one for backpacking and judicious winter trips. Is that a fair assessment? As far as your 4/5, is that really based mainly on the pockets? Is weight really the problem with those? I see them as a place for light, quick access stuff like rain gear, puffy coat, etc. This pack is certainly one that can handle itself well in backpacking trips and can candle itself for winter trips. It is a backpack designed for backpacking and for that reason can comfortably carry heavier loads. I was able to use it successfully this winter for ski mountaineering and overnight winter backpacking trips. I have found this pack to be a quiver of one in that it is capable in all seasons. Weight is not really the problem with the pockets, it’s more about weight distribution and stylistic preference. You’re absolutely right however, they are indeed a convenient place for light, quick access stuff like extra layers and clothing. I do recommend this pack as a natural progression for the 70l Madden as it is a workhorse pack that can accommodate more modern gear and the type of use you described.